Chinese New Year is just around the corner and many of us are gearing up to prepare for the annual celebration. For the Chinese, it is a celebration deeply rooted in culture and tradition. Chinese New Year is based on the traditional Chinese calendar which revolves around the lunar cycle. It is also known as the Lunar New Year or simply, Spring Festival. Here in Malaysia, the first two days of Chinese New Year are national public holidays. The celebration, however, does not end after this as it extends to fifteen days from the first day of the festive period. 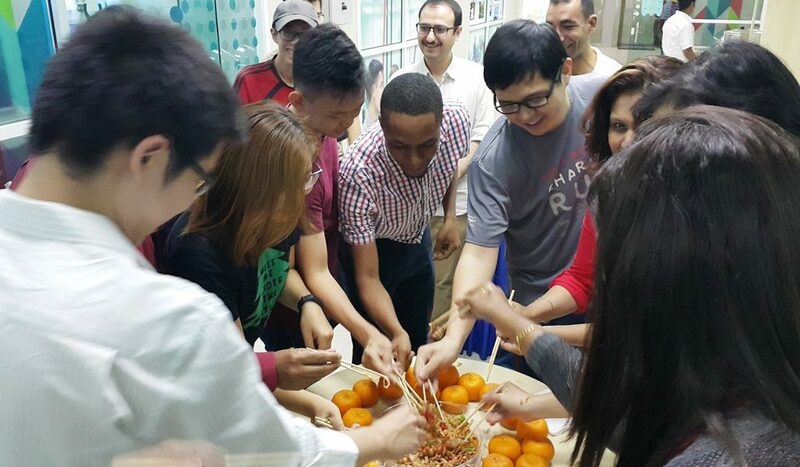 It is our tradition at the Graduate School to celebrate the festive occasion with our postgraduate students. This year, the celebration was held on 23 January. It was an early celebration before everyone is off for the holidays. The celebratory luncheon was well attended by our postgraduate students where they were treated with a variety of local Chinese dishes. The celebratory luncheon featured the tradition of stirring and tossing of Yee Sang, also known as Spring Toss. It is a Teochew-style raw fish salad comprising strips of raw fish mixed with shredded vegetables and a variety of sauces and condiments. Each ingredient represents something, based on their names in Chinese (P.S. Google it up if you want to know more!). All the ingredients are then mixed and tossed into the air to represent the rise of fortune. The higher you toss, the higher your fortune! Raise your chopsticks and toss to a generous tide of abundance for the new year! Toss it high and make a mess! 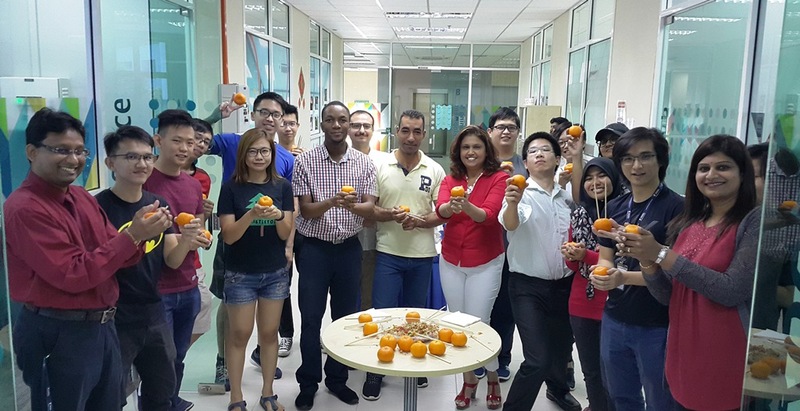 Known locally as lokam, mandarin oranges were also an integral part in the celebratory luncheon. But why are they a must during Chinese New Year? The Cantonese pronunciation for mandarin oranges sounds similar to gold. 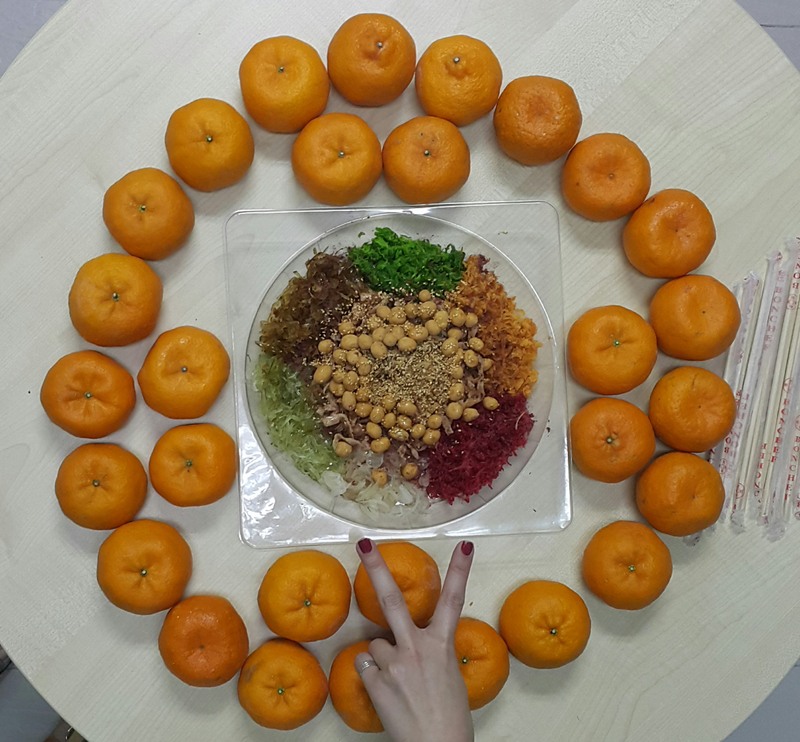 So having lots of mandarin oranges signifies prosperity. They are in abundance during Chinese New Year that there are even times when we lost count on how many mandarin oranges we ate in a day! We, at the Graduate School, would like to wish all a Happy Chinese New Year. May the Year of Pig be filled with auspiciousness for all of us. Here’s to a prosperous and auspicious new year! Reunion dinner, family and friends, fireworks, lion dances, open houses, ang pows, food and more food – there are so many delightful aspects to Chinese New Year whether you are celebrating or not. So if you have a memorable Chinese New Year moment to share with us, please email it to graduateschool.nottingham.edu.my. We would like to feature it on our postgraduate blog and social media platform.